Qwerty premieres at the Gene Siskel Film Center on Saturday, July 28th. Filmmaker Bill Sebastian is scheduled to attend. Qwerty is a film about lonely concepts of people and their quirky exploits. I use the term “concepts of people” to illustrate the type of picture that director Bill Sebastian and writer Juliet McDaniel attempt to construct. Zoe (Dana Pupkin) and Marty (Eric Hailey) are defined in broad strokes, providing the audience with two lead characters who haven’t much depth beyond their set of indie-inspired eccentricities. Much like the recently acclaimed Safety Not Guaranteed, the characters and construction of Qwerty fail to resonate as anything more than a hodgepodge of half-baked Sundance film festival pictures. The problem with films like Qwerty is that they depend on a level of disillusionment and detachment from reality that makes it difficult to ever fully accept. Conceptually, a film like Miranda July’s Me and You and Everyone We Know operates with the same hyperkinetic quirk that is found in Qwerty. And even with my reservations on July’s picture, I can appreciate the weightiness of its material and sobering tone. With Qwerty, the incomprehensible tonal shifts found throughout the picture, from Zoe’s bipolarity to Marty’s aggressiveness, are just too jarring to ever take the picture seriously. The picture shifts from a somber to a comedic tone on a whim, often in emotionally negligent ways. But most frustrating is the film’s odd narrative arc switch from Zoe and Marty’s relationship to Zoe’s goals of winning a Scrabble tournament – any and all dynamic tension between the two characters is shuffled and exchanged for a novelty sports act. This Scrabble third-act finale serves to underscore the dullness of the picture’s central romance, and rather than salvaging its established characters, we’re left with abandoned ideas and haphazard idiosyncrasies. 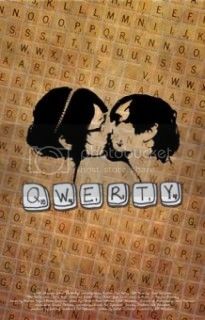 I really wanted to like Qwerty. Set largely in the downtown/north side of Chicago, the picture inhabits my own world. It’s also one of the few films in recent memory to utilize the city for its romantic qualities. But beyond its use of various tourist spots and the lakefront (which, commendably, is used as one of the picture’s more memorable plot points) there’s not much to unite the film spatially. Obviously this issue stems from a place of personal disappointment, but the picture deals with people in social and economical destitute positions – a clear view of the Chicago skyline simply isn’t something that people in their positions are going to have. Qwerty briefly flirts with how Zoe’s awkwardness stems from a place of economical depravity – but that brief encounter goes nowhere fast. Actually, that could be applied to Qwerty in general.